Our original guitarist, Derrel Houdashelt (aka D. Attacker of Dekapitator fame) has been posting a few pics on Faceback that take me way, way back and I thought I'd share 'em here for your viewing pleasure along with a little context on these gems. 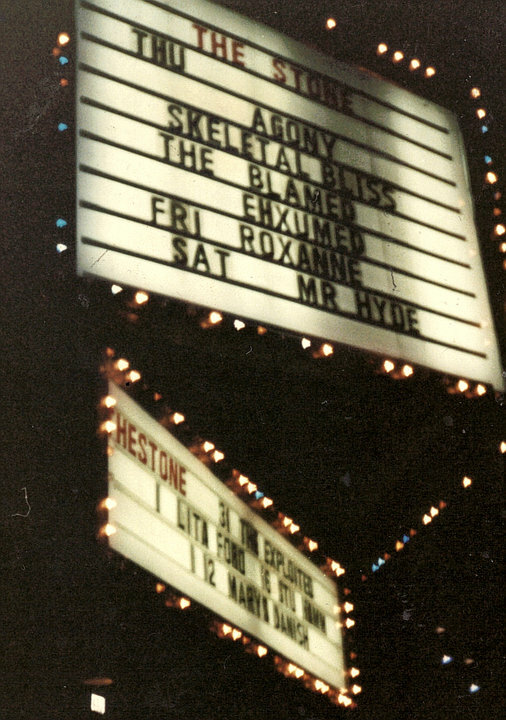 This one on the right here is the Marquee for our first show ever, way back in October 24th, 1991 - to put it in perspective, this was five days after my sixteenth birthday on a Thursday night at the legendary San Francisco Rock club The Stone (R.I.P. ), as made famous in the Cliff 'Em All video and some really cool black and white footage of Kiss in the 70s. Anyway, there were about 5 people in the audience that night, including Col's parents, Max Ward of Plutocracy / Spazz / Capitalist Casualties fame, Rich, guitarist of Immortal Fate, and Mark Smith, who later did vocals for Exhumed on the "Cadaveric Splatter Platter" tape(s) and was in a Gilroy-based band called Burial with some guy named Mike Beams on guitar, who ended up fitting into this story a few years later. Needless to say, fame and fortune did not come a knockin' after this inauspicious beginning. We had completed our rehearsal tape about a month before and this night was our indoctrination into the infamous "pay to play" business practiced by The Stone and its sister clubs in the East Bay (the Omni) and the South Bay (One Step Beyond) where we would spend the next two years slugging it out in various support capacities to many of our favorite bands like Morbid Angel, Master, Cannibal Corpse, Entombed, Autopsy, Sadus and many, many others. 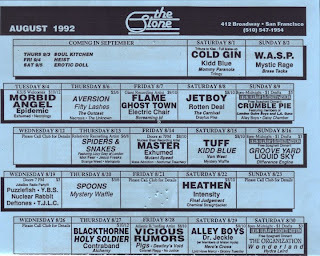 Here's the August 1992 calendar for The Stone, the month we played with Morbid Angel and Master for the first time of many. As you can see our fortunes by then had improved considerably, as 4th-rate thrash bands like Skeletal Bliss were nowhere in sight on those bills. Armed with extremely limited musical ability and an overload of enthusiasm, we grinded our way through those first few years penning ditties like "Oozing Rectal Feast", "Ziploc Body-Bag" (a title suggested to us by some dude in line outside the Omni in 1991 whose name has long since escaped me), and "Festering Sphinctral Malignancy", and playing incredibly sloppy grinding Death Metal while having the time of our lives. While other kids in high school were undoubtedly enjoying milestones like their first prom night, we were hanging out backstage and learning about the underground from guys like Chris Riefert and Alex Webster. I think we definitely came out ahead there. I may have been a loser with the girls at school, but knowing that I was going to be opening for Entombed or whoever it happened to be that month in a few weeks made all the boredom and stupidity of high school completely bearable - that and the fact that I pretty much slept through most of it anyway. Here's a pic from our first band photo shoot - from left to right- Derrel Houdashelt, guitar, Col Jones (seated), drums, Jake Giardina, vocals, and yours truly, guitar and backing vocals. Derrel and Jake were a little older than Col and I (I was defintiely 15 here, Col may have been 16, Jake was 16 or 17, and Derrel was 17) and at least had the good sense to wear pants. 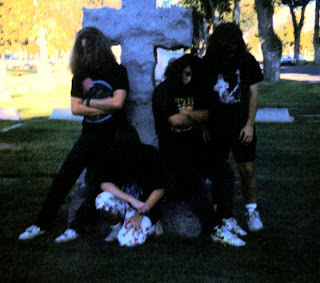 As you can see, Exhumed has always been the paragon of orignality, doing a photo shoot in graveyard was of course as cliche as a Death Metal band could possibly get. Apparently no one told me not to wear athletic shorts that don't even go to your knees in your heavy metal band photo. But we were Californians, and wearing shorts every day was pretty much the norm. I don't remember who took this photo, it may have been Stephanie Dean, a girl I had a gigantic crush on in high school, who is actually now an accomplished photographer, but I don't know for sure. At any rate, only Col stuck with the tradition of putting all of one's hair in front of one's face all the way though to his recent days in Cretin. Always, the purist, that guy. Here's a shot of Jake (foreground) and Derrel (background) at the Omni in Oakland with Kindred of Plutocracy in the background in full SF Giants regalia. The Omni was always our favorite place to play back in those days, huge stage, relatively good sound, and always the best turnouts for Death Metal shows there. Plus the owner used to give us all the free soda we wanted. We were real party animals in those days. 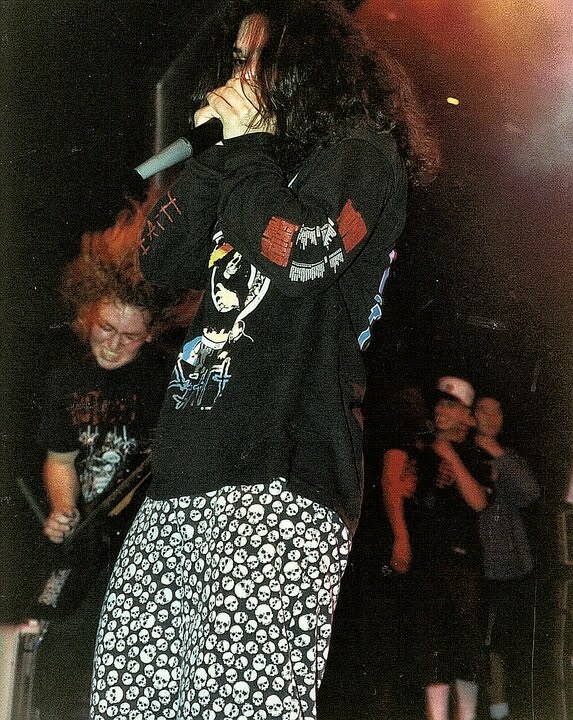 Jake is seen here sporting some sweet skull jam shorts sewn by Col's mom. For some reason we took it upon ourselves to wear ridiculous bermuda shorts with even more ridiculous patterns on them onstage. Everything from the relatively "cool" skull pattern seen here to crayons, dinosaurs, fish, and anything totally stupid you could think of. 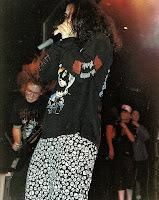 There was one particularly cringe-worthy occasion in 1992 at One Step Beyond with Phobia, Plutocracy, and Morgion where Derrel played in an "Ernie" shirt (as in Seasme Street) and Jake was wearing fuzzy bunny slippers. Col's mother Mary, truly one of the most wonderful people I've ever known, was sweet enough to sew our shorts for us. And yes, we picked out the patterns at the fabric store, not her, so don't blame a sweet woman for five teenage idiots wearing dino shorts. I usually stuck with my plaid or checkered Mervyn's-bought "surf" shorts, but I rocked the skull jams a few times myself. 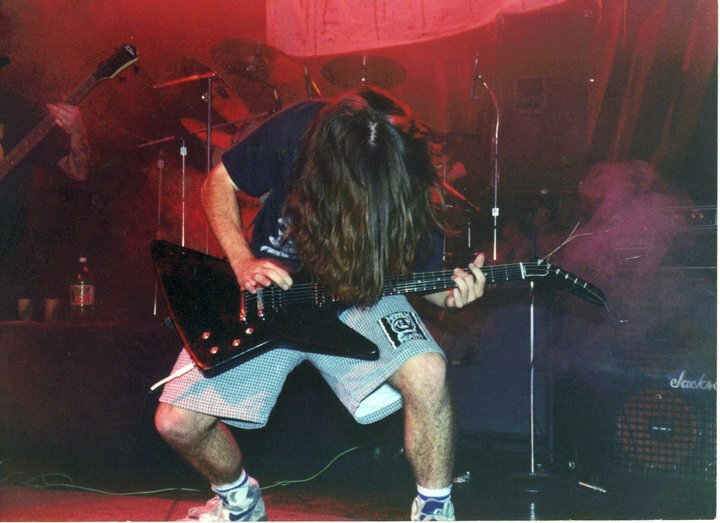 To the left here is yours truly with my good friend Kris Berlin's Gibson Explorer (I seemed to always be borrowing someone else's guitar in those early days) - he played in one of our favorite local bands back then, Enucleation (guess where we got the song title for that song on "Gore Metal" from? - I told you earlier we were incredibly original) and for some reason, I thought a good fashion statement would be putting a Napalm Death sticker (not patch, sticker) on my shorts for this show. Unfortunately, our hilariously amateurish banner can't bee seen in this shot. Maybe when I get all my stuff out of storage and a scanner, it'll make an appearance. Anyway, had a few minutes to kill and those pics got me a bit nostalgic. Next update will be current and informative- and will be 99% dinosaur-shorts free. haha this is still fairly relevant. I didnt come into the scene really till 99/2000 and it takes me back. Man, after reading this I'm going to have to start listening to Exhumed again. Fantastic stuff. the stone did a hell of a job spelling your name, haha. enucleation rules.